Are you looking to set up a small web server, an internal file server, a server to host security applications, or a server to host your company’s internal communications? Look no further: the answer is creating a NUC server shelf. 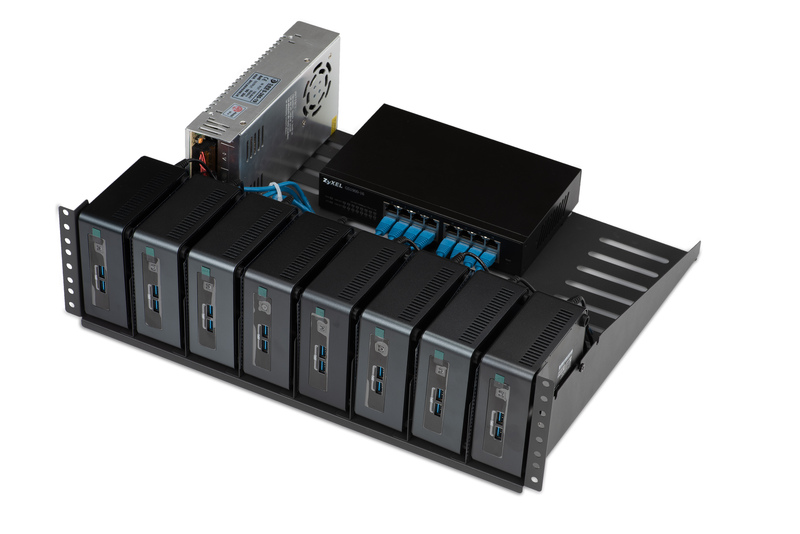 We supply the metal chassis to house up to 8 “H” or “K” chassis NUC units, with an optional power supply and unmanaged or managed 16 port switch, dependent on your needs. If you aren’t sure which NUCs to use in order to set up a server, we’ve got some suggestions for you. 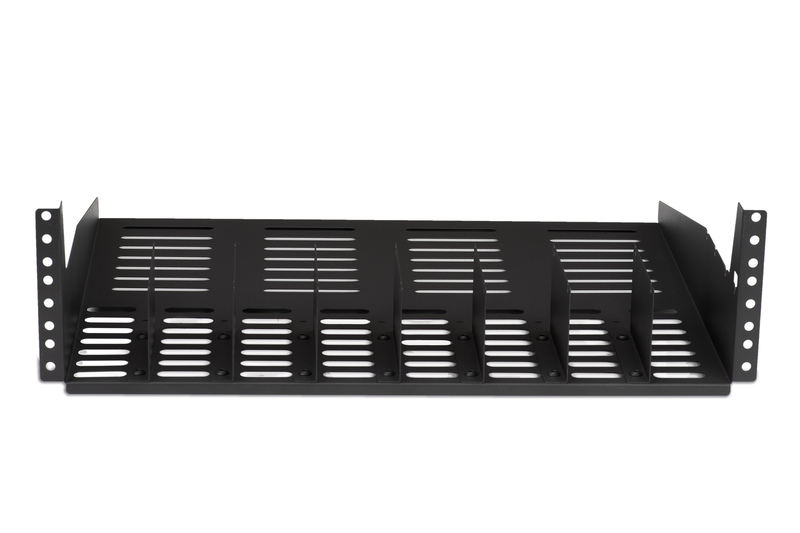 This full-metal server shelf conforms to the standard 3U size and will also fit a Telco rack. It’s designed to fit comfortably between neighboring equipment and can be purchased by itself to house up to 8 standard-sized “H” or “K” chassis NUC units. The shelf, itself, is the metal casing which houses the NUC units. 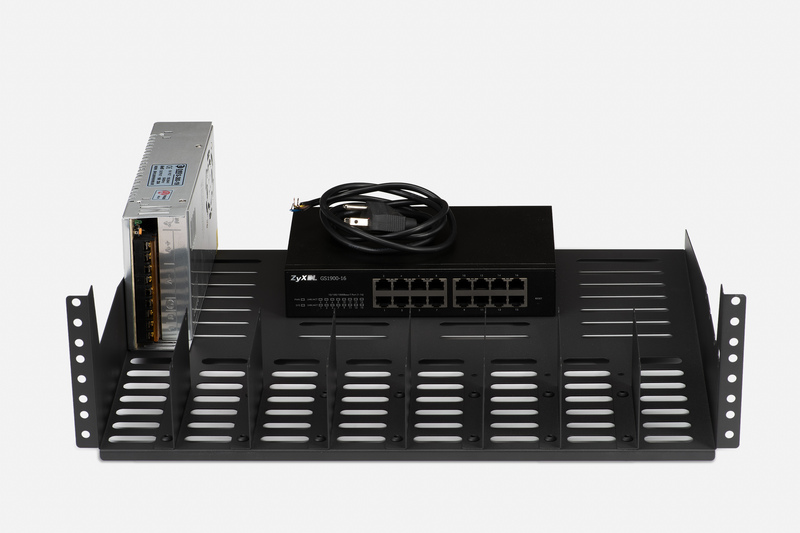 It can be purchased with a 16 port switch, managed or unmanaged, and a power supply. If you purchase accessories for your shelf, we will install those for you. Simply NUC offers two switch options for use with this shelf. Each switch comes with 8 Ethernet patch cables. 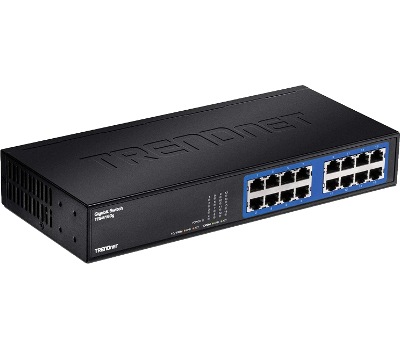 This switch is ideal to create an array of redundant, high reliability operating systems with granular control of your network traffic. 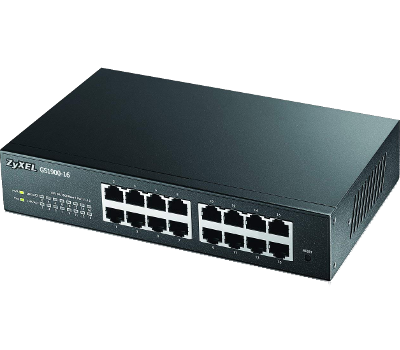 This switch works great if you just need a cluster of NUCs with fast, hassle-free packet forwarding to act as your server. 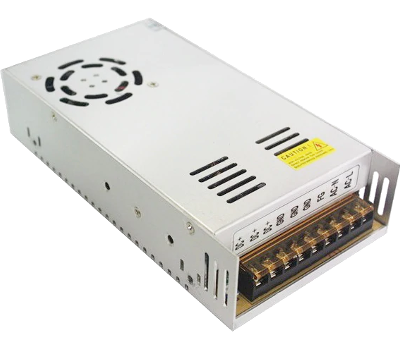 This 110V / 220V AC power supply provides 19V@20A (380W) of power to keep your array of NUCs running. Its small frame makes it easily tucked away on the shelf and minimizes the distance from the units, which helps with cable management. Simply NUC would like to suggest some NUCs for your potential server shelf. 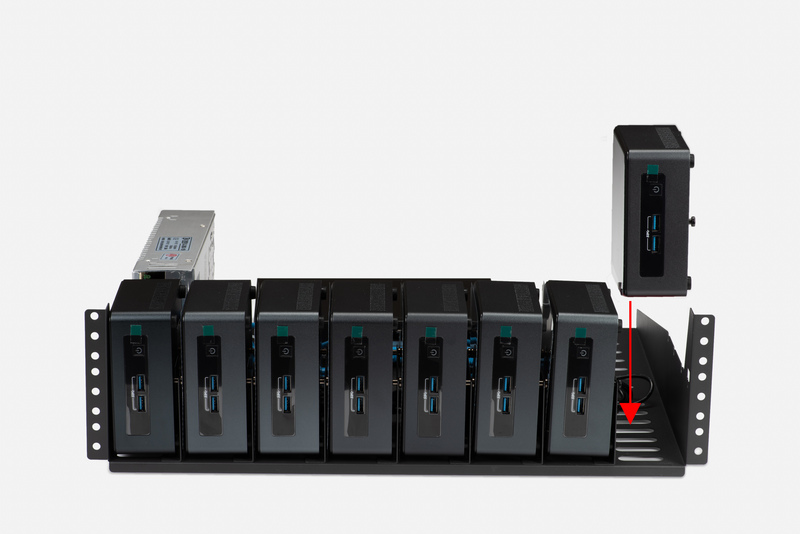 For a high performance server, Simply NUC suggests using a set of 8x Bean Canyon 8i7BEH units. These units feature Intel® Core™ i7-8559U Quad Core, Hyper-thread enabled processors, running at 2.7 GHz with 4.5GHz Turbo Boost, 8 MB Cache, and supporting up to 32 GB of high speed DDR4 RAM and 8 TB of SSD storage. This is one of the most powerful NUC units that Intel® makes, and a group of eight of these should handle most server-based tasks with ease. 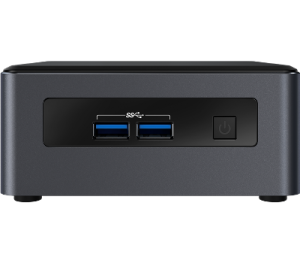 If you want remote manageability with an extra layer of security for your NUC server, then Simply NUC would like to suggest picking up 8x vPro enabled, AMT configured Dawson Canyon 7i7DNHE units. The vPro enabled, AMT configured processor lets you access your unit remotely with a layer of hardware-based security to keep your network safe and keep uninvited guests away, and the processor can handle up to 32 GB of DDR4 RAM to get the performance that your server needs. See the 8i7BEH unit here. See the 7i7DNHE unit here. *Power supplies are on backorder until May. 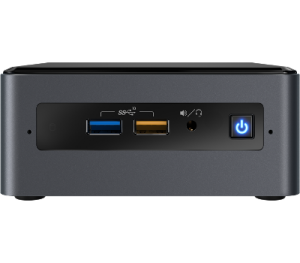 Are you looking to purchase the NUC server shelf that will fit your needs? Fill out this form and we would be happy to discuss that with you. No, I already have NUC units. Yes, I would like to purchase NUC units with the shelf.